Former Bonnyrigg Rose boss Max Christie enjoyed success on his return to New Dundas Park as the Rose suffered a 3-1 defeat to Bo’ness United last weekend. It was only the second loss the Midlothian side have had since losing to Deveronvale in the Scottish Cup last September and ended their unbeaten run in Conference B.
Bonnyrigg came into the match on the back of a resounding 5-1 win over Lothian Thistle Hutchison Vale but it was the visitors who started brightly and deservedly went in front on 23 minutes as Morgan’s powerful shot from outside the box flew into the back of the net. 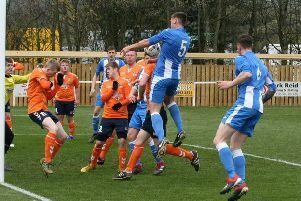 Bo’ness doubled their lead just a few minutes later when a corner was not cleared properly by the Rose defence and Hunter took full advantage to fire past Bryan Young in goal. Rose weren’t seen much in an attacking sense, free kick specialist Lee Currie came close on a couple of occasions but wasn’t able to hit the target from a deadball situation. Robbie Horn’s men could have fallen further behind after the break when Brown conceded a penalty after a tackle on Keast but Young once again displayed his penalty-saving heroics when he denied Donnelly from the spot. Things were to get worse for the Rose when Brown was sent off for a second bookable offence on Keast, his earlier misdemeanour in the ninth minute coming back to haunt the defender. The Rose gave themselves a lifeline with ten minutes remaining when they halved the deficit through Keith Lough’s looping header. All hopes of a comeback were extinguished when Wright sealed victory for Bo’ness with his 19th goal of the season, striking a sublime first-time effort into the top corner to move the BU’s back into second place. Bonnyrigg: B.Young, Brett, Brown, K.Young, Horne, Currie, Turner, Stewart, Lough, Murrell, Gray. Subs: Martyniuk, Swanson, Nelson, Moyes, keeper Mike Andrews.